Our Way – We manufacture our signature Low Loader from the ground up. We can tailor, customize and personalize your Low Loader, from the big picture, right down to the little details. Our goal is to build trucks that set the standard in the industry, and to build you the truck of your dreams. Customer’s Choice – If you want to start from scratch, there are two ways to get started. You can purchase a heavy-duty truck, either new or pre-owned, and we’ll remove what is needed to make way for the Low Loader. Another option is to select the cab-and-chassis, and we build the Low Loader onto the waiting frame. We work with lots of great local dealers, including Ford, Freightliner, and Hino. We will find you the right truck with the options you need. From the Ground Up – Once we have your cab in the shop, our expert manufacturing team goes to work. They surgically remove whatever is on the chassis, if anything, and prepare it to become the foundation and support for the Low Loader. Once the frame is ready, the pylon and hydraulic tanks go on. Then our team installs the control section. The wheel lift goes on after that, then the subframe, and then the accessories. The hydraulics and the electrical systems go in, and then, very last, the actual flatbed. Finish Line – Your Detroit Wrecker signature Low Loader will be a work of art that not only looks great, but also works hard, requires less maintenance than other carriers, and is built to last. You’ll drive happy knowing that your truck will out-lift, out-haul, out-work and out-live the other trucks on the road. You’ll have peace of mind that you’ll need minimal maintenance on pivot points, and your cylinders have 4 year warranty, and your pins, bushings, control handles, and craftsmanship are all backed by a Lifetime Warranty. We are intensely proud of our products, and we know you’ll be happy with your purchase. Versatility – The Low Loader is the most versatile truck on the road. The extraordinarily wide range of motion of the bed gives it the ability to maneuver any situation, and makes it the solution to any challenge. The high dump angle is perfect for any junk application or dumping activity. The extremely low load angle makes it perfect for all kinds of loading needs, from exotic sports cars, to heavy machinery and pallets of product. The Low Loader’s independent wheel lift has an extremely high strength capacity. Whatever your operation, specialty, or services you offer, this truck is the perfect carrier for you. 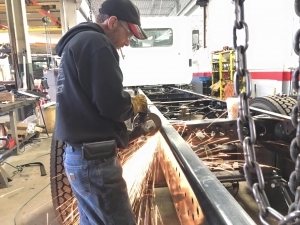 Detroit Wrecker is constantly improving our products, and as customers ask about certain details and options, we will build the truck that meets their needs, and exceeds their expectations. Quality – The Low Loader is not a cheap, bargain, discount truck. We use top-of-the-line materials, tools, and craftsmen. The Low Loader is built by experts who also repair other brands of trucks, accessories and equipment. We have spent years repairing other brands’ equipment, and testing products. We have resolved many issues and taken steps to prevent common potential problems that are known in the industry. Detroit Wrecker strives everyday to make a positive impact on the industry by always working to set and exceed the standard. Craftsmanship – Our crew are experts in their field, experienced in the industry, and passionate about what we are doing here. We design and build products to perform and to last, without the planned obsolescence that seems to invade every product in every field these days. Longevity – Down to the smallest details, from pins and bushings to each cut and weld point, our fabricators, manufacturers and service technicians strive to craft a quality product. We build the trucks, parts and accessories that outperform, outlast, and outsmart the competition, the industry, and most importantly, the job, and look good doing it. The Low Loader is not a temporary vehicle. It is designed for long term use, and will be with you for the long haul. Design – We can tailor your Low Loader to suit you. 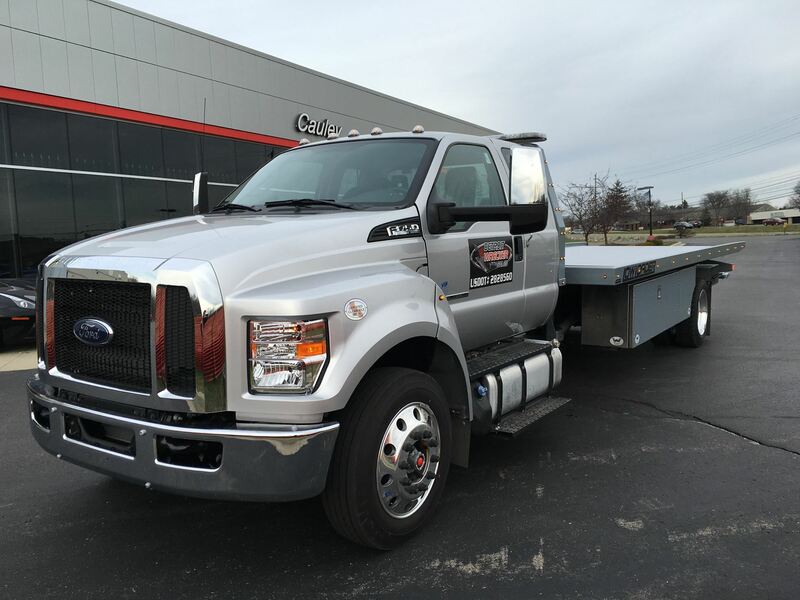 From helping you select the cab-and-chassis that is right for you, to customizing the options, details, and finishing touches to make it yours, your Low Loader will be a completely customized design from start to finish. Pride – We build trucks that work harder, last longer, and look better than any other truck out there. 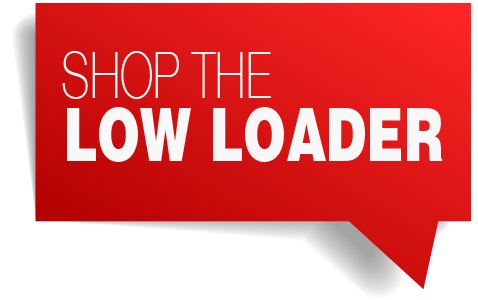 We know you will be happy with your purchase, and look forward to adding you to our club of proud Low Loader owners. The best Low Loader ever built is the one we will build for you!